WASHINGTON (CNS) — Latin-rite Bishop Thomas J. Olmsted of Phoenix has been appointed apostolic administrator of a Byzantine Ruthenian eparchy also based in Phoenix, the Holy Protection of Mary Byzantine Catholic Eparchy. The appointment by Pope Francis was announced Aug. 1 in Washington by Archbishop Christophe Pierre, Vatican nuncio to the United States. Bishop Olmsted, who remains the head of the Phoenix Diocese, said that the current head of the eparchy, Bishop John S. Pazak, remains in place. Originally based in Van Nuys, California, the Byzantine eparchy first transferred its offices to Phoenix and later adopted Arizona’s largest city as its base. 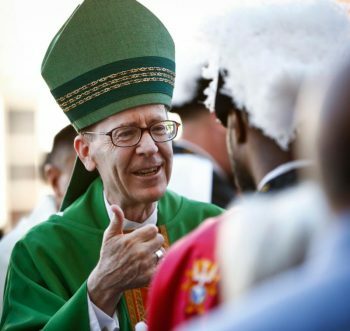 In an Aug. 1 statement, Bishop Olmsted indicated a legal dispute among Eastern Catholics in the United States was the reason for his appointment as apostolic administrator “sede plena,” which he said is “for the time being” until the matter is resolved. The appointment “has not come about because of any personal misconduct of any kind on the part of Bishop Pazak. Indeed, Bishop Pazak remains as the bishop of this eparchy,” Bishop Olmsted said. His appointment as apostolic administrator was made to “facilitate the task of resolving these legal matters, and to support the efforts on everyone’s part to build up the communion within among the other eparchies of the Eastern Catholic Church,” Bishop Olmsted said. He added there is no fixed term to his appointment. Bishop Olmsted has been bishop of Phoenix since 2003. Bishop Pazak has been bishop of his eparchy since 2016 following the retirement of Bishop Gerald N. Dino. The eparchy has 19 parishes and one mission over the 13 western states in its territory: Alaska, Arizona, California, Colorado, Hawaii, Idaho, Montana, Nevada, New Mexico, Oregon, Utah, Washington and Wyoming.